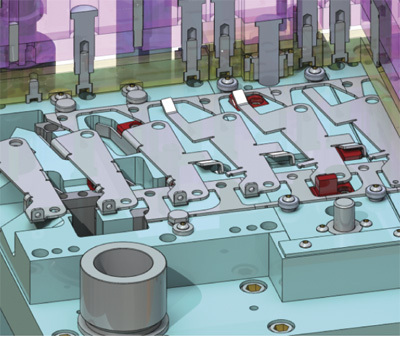 Accurate Die Design, Inc., New Berlin, WI, provides Logopress3 3D die-design software (SolidWorks Gold Certified) as well as standalone Forming Technologies Inc. forming simulation, flat-blank prediction and quoting software. Logopress3 features automatic 2D drawing creation, tool animation and dynamic interference detection, and is capable of designing large dies as well as dies for tiny parts that have several hundred stations. Included is a vast component library of catalog components-inch and metric. Logopress3 also produces a fast, economical finite-element-analysis software package called Logopress3 Blank-which requires no formal training-that also analyzes stress, strain and thinning.